When Is It Right (or Wrong) to Rebel? 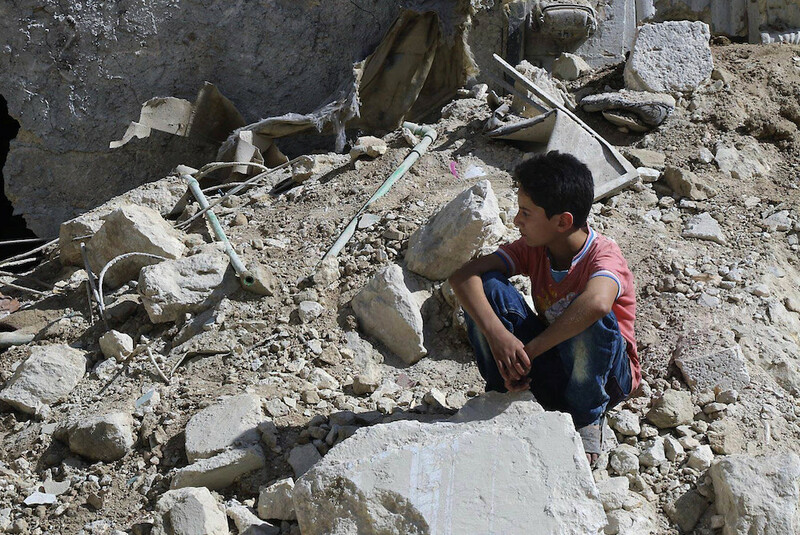 A boy sits amongst rubble in eastern Aleppo, Syria, in 2016. Photo courtesy of Associated Press. When protesters confronted the autocrats of Tunisia, Egypt, Libya, and Syria early in 2011, many liberally minded people around the world hailed this Arab Spring as a moment of great hope, comparable to the velvet revolutions of 1989 in Eastern Europe. But the picture soon got complicated. Whereas the Tunisian and Egyptian regimes capitulated relatively peacefully, only the Tunisians secured democracy, as the Egyptian revolution was subsequently overturned. Libya and Syria both descended into civil war. In Libya, the outcome has so far been an unstable political vacuum. In Syria, the death toll may exceed 500,000. Millions have been displaced, in refugee flows that have fueled challenges to liberal democracy in Europe. Now, the Syrian revolution faces outright defeat. These facts—a success rate of only one in four and all the resulting deaths —present a troubling conundrum. Do we still believe that oppressed people have the right to resist? Or should we question whether a decision to rebel can really be justified? One method for answering that question is to re-read philosophers on the subject, John Locke and Thomas Hobbes, both from the 17th century. In the minds of pro-democracy people, John Locke’s Second Treatise of Government (1689) and its arguments for freedom and the right to resist oppression loom large. Thomas Hobbes, on the other hand, wrote Leviathan (1651), a great defense of absolute monarchy. You might think Hobbes would simply discourage today’s freedom struggles, but the important insights his work offers into the dangers of rebellion aren’t necessarily the ones we might expect. Hobbes’s arguments were worked out against the backdrop of political conflict in mid-17th-century England. He believed the excitement raised among parliamentarians by the revival of ancient republican ideals of “free government” had led them to tear down the walls that protected them. Aiming for the best they brought about the worst: civil war. What they should have done instead was settle for a middle way: a government that, while not ideal, at least held off the danger of widespread violence within the state. Personal security should have been prized higher than dubious ideals of freedom. Transposing this argument to modern Syria, we seem then to have clear advice: It would have been better for the Syrians of 2011 to let things be, no matter how oppressive Bashar al-Assad’s regime was. And as for us liberals, if we cheered on the Syrian protesters like good Lockeans in 2011, we ought to have learned our lesson by 2018 and should now be shaking our Hobbesian heads in despair at our earlier naiveté (and theirs). I think we can learn a lesson from Hobbes, but I’m not convinced that this is it. His political thinking points to a much more nuanced analysis. The foundation of Hobbes’s theory of sovereign authority is what he calls the “Right of Nature”: All individuals can be expected to employ whatever means best preserve them against lethal threats, and everyone, he thinks, is permitted to do so. For people living in a world without government—the “Natural Condition”—the best means might include robbery, violence, and the preventive killing of anyone who could pose a threat. But in a society enjoying the benefits of a sovereign government with enough power to impose peace between citizens, the same Right of Nature dictates a different strategy. Such a government, whether republican or monarchical, overcomes the problem of mutual distrust between unprotected individuals by enforcing laws and agreements, making it possible for people to enjoy a peaceful, comfortable life. Thus, people should obey the government. It’s the latter strategy that seems to recommend non-resistance against a regime like Assad’s. But Hobbes entered an important caveat to his theory. If the reason for obeying government is self-preservation, then what if the government itself threatens your life? In these circumstances, he thought, self-preservation may dictate forceful self-defense. Hobbes therefore concluded that individuals retain the right to defend themselves against actions by the state that threaten their lives. So, in fact, he suggested three strategies for preserving yourself, each suited to a different context and each morally justified by the Right of Nature. The first is preventive attack in the Natural Condition. The second is passive obedience in a sovereign state that protects you. The third is self-defense in a sovereign state that attacks you. How would these three strategies have played out across the population in Syria in 2011? Let’s assume that before the outbreak of violence in 2011, most citizens would have been best advised to follow the second strategy—to obey a sovereign Syrian state that protects them. Even so, things changed suddenly in February 2011. The trouble began when security forces arrested 15 teenagers in Daraa, accusing them of graffitiing their school with slogans such as “the people want to topple the regime.” Terrified by rumors that the detained children were being tortured, demonstrators demanded their children back, and protest spread to other parts of Syria. The regime resorted to force and, on March 18, security forces shot (approximately) four people dead, and wounded hundreds in Daraa. By late April, escalating violence brought the city under full-scale military siege. Hobbes takes the unusual view that even people engaged in wrongdoing (such as unprovoked armed resistance) have a moral right to defend themselves against state violence. If even wrongdoers have this right, then those who are innocent certainly do. And he thought their rights extended to protecting their children, too. Hobbes explicitly argues that it would be both morally and psychologically too demanding for political philosophy to insist that parents acquiesce in their own children’s imprisonment, torture, and possible death. From a Hobbesian perspective, the danger for a government using force against members of its own population is that it is therefore likely to create an ever-widening category of people who are thereby released from the duty to obey the government. This is true even if —unlike in Syria—state security forces only intend to harm those who (in Hobbes’s view) wrongfully rebel. Any large-scale use of force almost always causes unintended harm to innocent people when they are mistaken for legitimate targets or exposed to risks of collateral damage. This means that, for every person the security forces deliberately threaten, others will also feel threatened. Hobbes takes the unusual view that even people engaged in wrongdoing (such as unprovoked armed resistance) have a moral right to defend themselves against state violence. If even wrongdoers have this right, then those who are innocent certainly do. The moral and political legitimacy of any regime depends on maintaining a wide enough social base that feels under an obligation to follow its commands, but this base can be diminished in two ways. First, spontaneous opposition might occur even if the regime hadn’t initiated any threat against its members’ lives. Second, defensive opposition includes those who haven’t rebelled spontaneously but who find themselves threatened by the regime and needing to defend themselves from it. The more force a regime like Assad’s uses against its opponents as a whole, the more it expands the population engaged in defensive opposition. And if it keeps intensifying its violence as the opposition grows, then it will progressively eat away at its social base by forcing more and more people to change strategy from obedience to self-defense. If the government persists in doing this, then eventually the ratio between the regime’s social base and its opponents will reach a point where the country has fallen into full-scale civil war. For Hobbes, civil war constitutes the death of the body politic and the greatest danger to those trying to survive within it. The need to avoid it was the reason why he doubted the idea of deliberately seeking political revolution. But avoidance of civil war is also the aim which ought to motivate governments, on his analysis, in their decisions about how to rule. Hobbes’s theory of rightful self-preservation helps identify errors that a regime like Assad’s should have avoided. The philosopher’s analysis thus suggests that many people finding themselves in the spiraling cycles of violence that began in 2011 had no credible alternative and were therefore justified in resisting a regime that actively threatened them. We really can’t condemn those people. But what we can condemn is the government because it has failed its chief objective, which was to prevent the outbreak of civil war. Assad’s mismanagement of violence itself helped create and then expand the basis for legitimate defense against the regime and, hence, for wider rebellion and civil war. So, what would Hobbes do now? After seven years of fighting, Syrian forces have recently retaken Daraa and are close to a complete victory over rebel forces. Now, it might seem tempting to think that Assad has made good on his mistakes and that a Hobbesian analysis would point towards a renewed obligation to obey the regime in Syria. But I think this conclusion is doubtful. Hobbes argues that political obligation begins in a covenant by which individuals commit to obedience for the sake of protection. It is highly doubtful that a leader who has laid waste to vast swaths of his country, massacred hundreds of thousands of his own people, and secured victory over domestic opponents only with the military assistance of at least two major foreign powers (Iran and Russia) could offer to surviving Syrians a credible partner in a new social contract. Syrians may not presently have any alternative to turn to. But Assad doesn’t even have the minimal legitimacy of a Hobbesian monarch, let alone anything that would merit the approval of a Lockean. Viewed in the unforgiving light of Hobbes’s political theory, his regime remains the problem; it is unlikely to have become the solution. Christopher J. Finlay is Professor of Political Theory at Durham University. His books include Terrorism and the Right to Resist: A Theory of Just Revolutionary War and Is Just War Possible?